Speaking of poolside chilling, a major concern most often is the outfit. So many of you girls write to me asking about resort wear and trust me when I say I completely understand the dilemma. My go-to option has usually been shorts with a sheer shirt layered over a bright bikini. 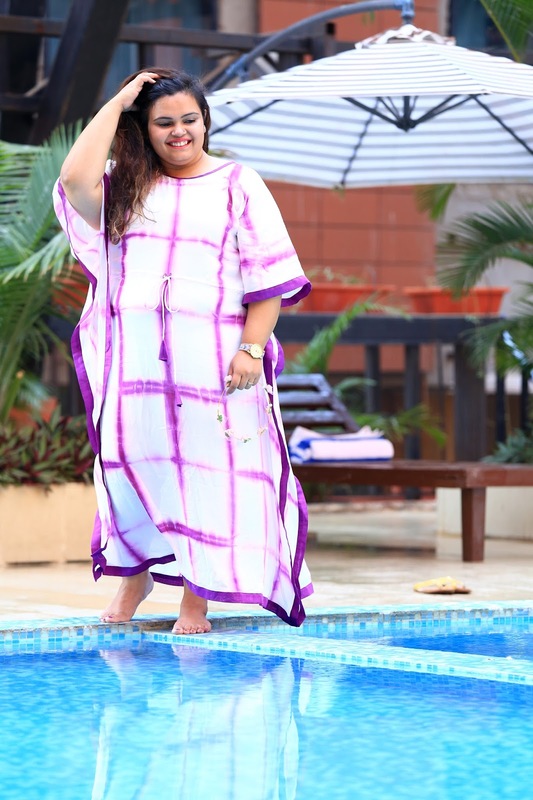 However, in the recent past, I'd been lusting over gorgeous kaftan dresses on Pinterest and couldn't wait to get my hands on one. I witnessed designer Purva Pardeshi's collection during Pune Fashion Week (September 2016) and was absolutely in love! Her label is called RED and her collection 'The Urban Warrior' unveiled during the show had me spell-bound given the exquisite embellishments and embroidery. 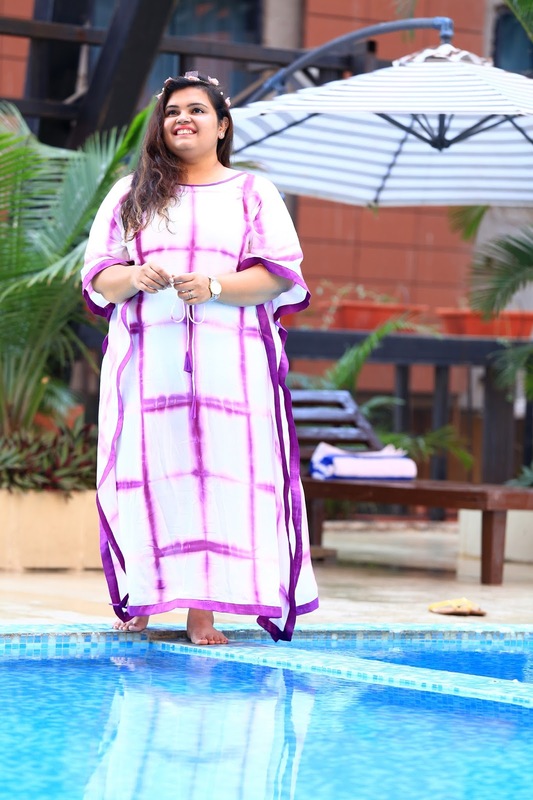 When summer was around the corner, Purva introduced a piece that put an end to my quest for the perfect poolside outfit with her Tie & Dye Kaftan dress. 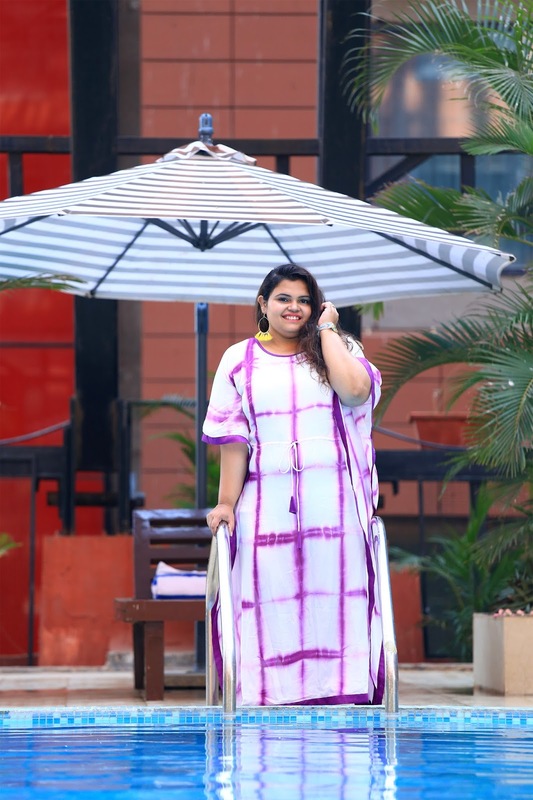 I recently spent the most glorious day at Orchid Hotel just rejuvenating and of course some extra time by the pool in my uber comfortable and chic outfit by Purva. A look at the pictures will definitely have you convinced about the comfort of this dress. A free-size pick, it comes with a drawstring that you can tighten depending on your preference. The fabric is extremely light and doesn't really stick to the body, which is my prerequisite when it comes to summer-time dressing. That tie-dye is one of my most favourite prints is now an established fact and when available in a lovely colour like this one, the outfit is a must-have in my wardrobe...For the fun aspect to the look, I paired my outfit with bright earrings and a flower tiara from Nautanki Jodi. 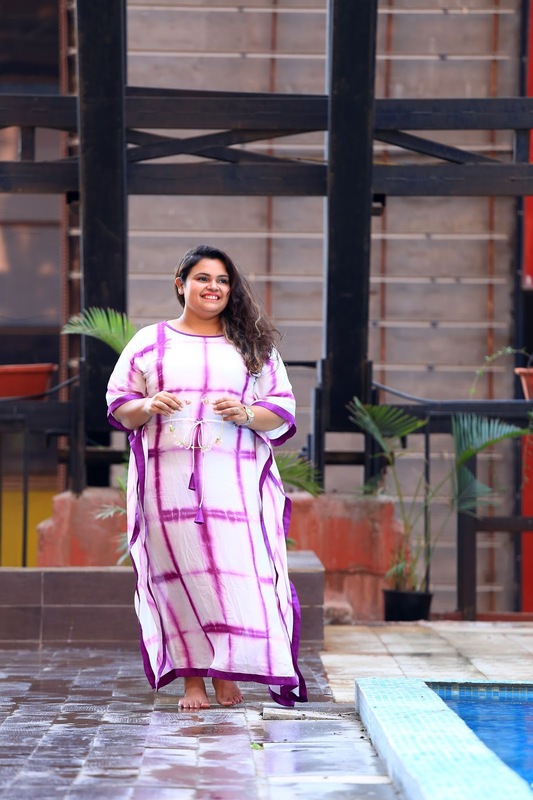 I hope you enjoyed this post and were as thrilled to read about this effortlessly stylish outfit by Purva Pardeshi as I was to receive and wear it.